I am really inspired by working with Melanie Reim on her klass for Sketchbook Skool. Her loose, fast drawing style and her ways of capturing people in motion is just what I need to loosen up. Here’s one of the pages I filled waiting with Jenny at the DMV. A couple of days ago we were invited to attend Sting’s new Broadway show. The music was good, the story and characters less so. During the second act, I pulled out my little Moleskine and a couple of pens. It was so dark I couldn’t seem my book at all and wasn’t sure what I was scrawling. During intermission, I flipped through my pages and, heartened, kept going after the curtain went up again. When I walked out of the theatre, I had the story of the whole evening recorded in my book and my grey cells. This sort of quick, take-no prisoners kept me fired up and, over the next few days, I drew a bunch of people in the street and from photos too. Another reminder that — as in rock ‘n’ roll —sometimes speed and volume are just the ticket to loosen you up and silence your inner monkey. 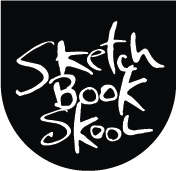 Oh, and that Sketchbook Skool has the power to change your view of the world. Even if you just work there. Previous Post Another nice article and video about my visit to China. There seems to be a Melanie Reims “effect” ravaging Sketchbook School Tribal members. Symptoms include but are not limited to inability to sleep, a tendency to make marks on anything that will stop in front of one, minds being blown, worst of all is creative chaos. Art material manufacturers are concerned about supplies. Thank you Danny and Koosje, and of course the infectious Melanie definitely ground zero. For the first time (in my life, I think), I actually drew people in motion without analyzing it to death. THANK YOU MELANIE!!! Her class has had a definite effect on my art. It was just what I needed to loosen up and let the pen do the talking. My favorite teacher so far. Would LOVE to take a workshop with her!!! She is definitely the BEST teacher so far!!!! More of her caliber please! Oh yes Danny, I love your drawings of the people in the street and the theater. And I’m going to the theater next weekend and had planned to draw in the dark too. M. Robert…I’m having that joy (problem?) too with making marks on anything I can find around me. I’m much more spontaneous with my efforts since I joined SS. Thanks Danny and Koosje! Speed, volume, and more cowbell. Melanie had me drawing in the dark, too! Last night at a philharmonic performance. Not sure if the music enhanced the pleasure of drawing or the other way round, but it felt great. Wow, am sorry I didn’t sign up for this session! You could probably still sign up. I think they leave the classes up past the end of the “official period”. So if you need a couple of extra weeks at the end to go back and do the first two weeks, you could. OH YES — COUNT ME IN ON THE MELANIE INFECTED!!!! SUPER SUPER CLASS! Dear Danny, apart from your wonderful blog contents, I have really been blown away by the stupendous washes at the top of each entry. The colours are good enough to eat, and speak directly to my heart. Thanks! Sorry for the double post. Not sure why that happened! Love that you were drawing in the dark at the theater. I discovered the delightful adrenaline rush that goes along with drawing in the dark while at the opera on a press pass a couple of years ago: http://www.fruitrootleaf.com/2012/10/performance-art-sketching-opera-in-dark.html.